Over the next few weeks I would like to talk about four watches which caught my attention whilst at this year’s Baselworld; two from large firms, one from an independent and one from a firm that fits somewhere between the two. 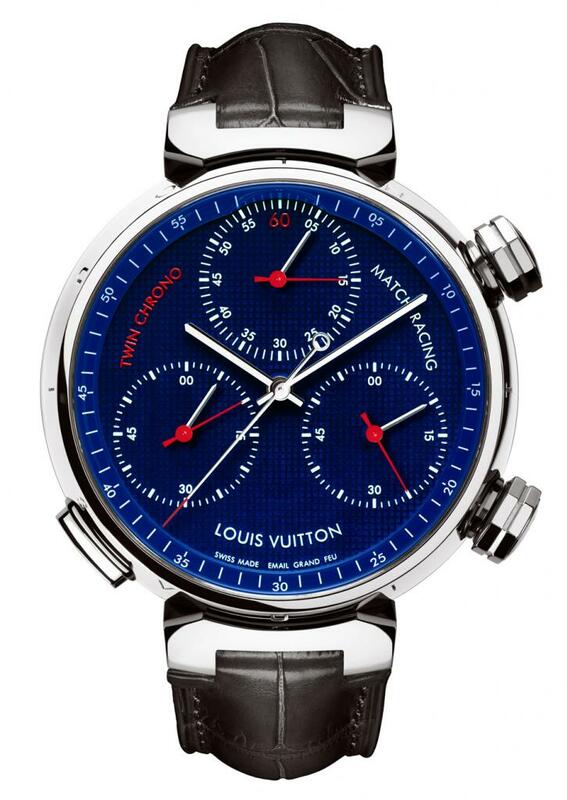 As that sounds pretty strange, let’s start with it; it is the Twin Chrono Match Racing from Louis Vuitton. Yes, you read that right, Louis Vuitton. First, some background, I don’t know if any of you remember a firm called BNB Concepts; they were one of the medium sized ‘horological hothouses’ which flourished in the early part of the first decade of this century; they made tourbillions, minute repeaters & other complications for brands as varied as Hublot, Concord, Bell & Ross and Romaine Jerome. Two of the partners, Enrico Barbasini and Michel Navas, left when an investment company bought their shares and they went on to found a new firm doing the same sort of work, ‘La Fabrique du Temps’ in 2007. But, in July 2011, the firm was bought by Louis Vuitton, who was already a major customer. Ironically the one founding partner of BNB who stayed with the firm until it crashed in 2009, Matthias Buttet, is now also in the LVMH ‘family’ as he now works at Hublot heading up their movements & complications department. All of this is to emphasize that Louis Vuitton is most certainly not your average ‘fashion brand’, placing ETA movements into overly styled cases with dials where the main attraction is the ‘designer’s’ name. 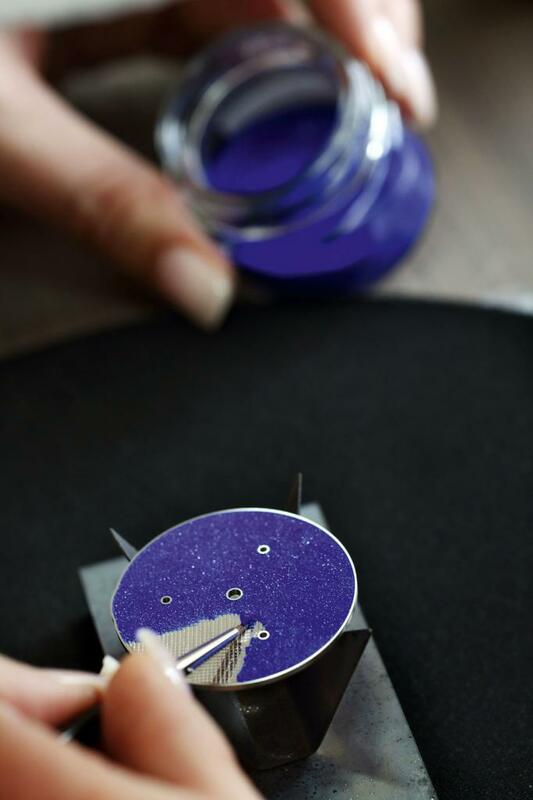 Rather they are now a very serious watchmaker with a substantial atelier in Meyrin, near Geneva airport (and also near Roger Dubuis, Cartier, Chopard and Agenhor) which, being in the canton of Geneva entitles their products to the Geneva Seal. To emphasize their serious intent, Louis Vuitton head hunted someone with a very significant track record, Hamdi Chatti, who came from Montblanc where he had turned their Minerva operation into one of the finest watchmaking operations in the world. Prior to that, he had run the watchmaking division of Harry Winston, where he had steered the Opus range to universal acclaim. 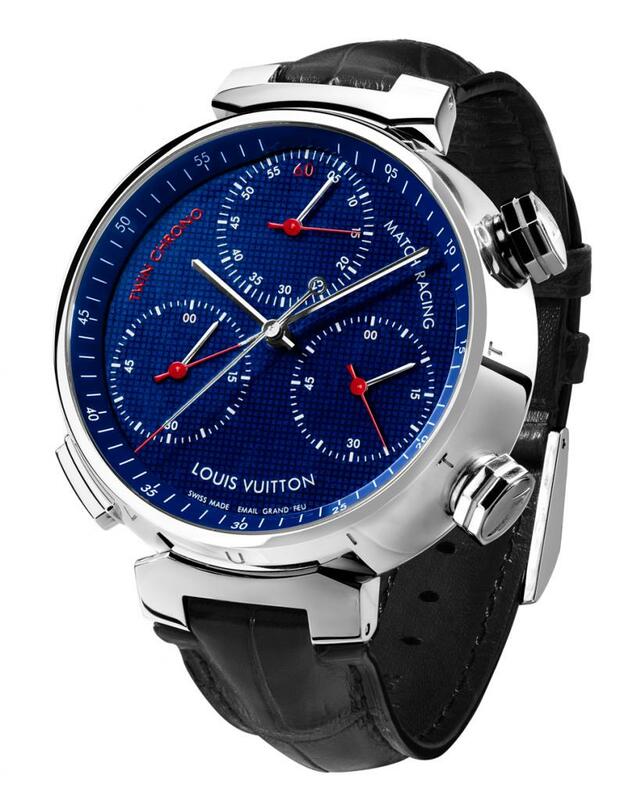 And this year Vuitton wanted to make their mark, which they did by introducing a very interesting new watch, the Twin Chrono Match Racing, which is, essentially, a re-imagining of the split seconds chronograph. As illustrated on this new Rado, to use a regular split seconds (rattrapante) chronograph to time the runners in a race, you press the top right button which causes the two seconds hands to rotate together; when the winner crosses the line you press the upper left button & one of the two sweep seconds hands then stops whilst the other continues around the dial. When the second place contestant crosses the line you press the upper left button again and the other seconds hand now stops; you are then able to make a note of the times of the two contestants, subtract one from the other & then you know the winning margin. The new watch simplifies this procedure immensely, reducing it from three buttons to just one. The procedure is similar, when the race starts you press the single button at the lower left and immediately the hands on the two lower dials start to register. When the first contestant crosses the line you press the button again & the dial on the left stops with the hands indicating the exact time taken, simultaneously the hands on the top dial start. Then when the second place contestant crosses the line, you press the button again & the lower right and upper dials both stop, with the lower one showing the second place time and the upper dial showing the winning margin. 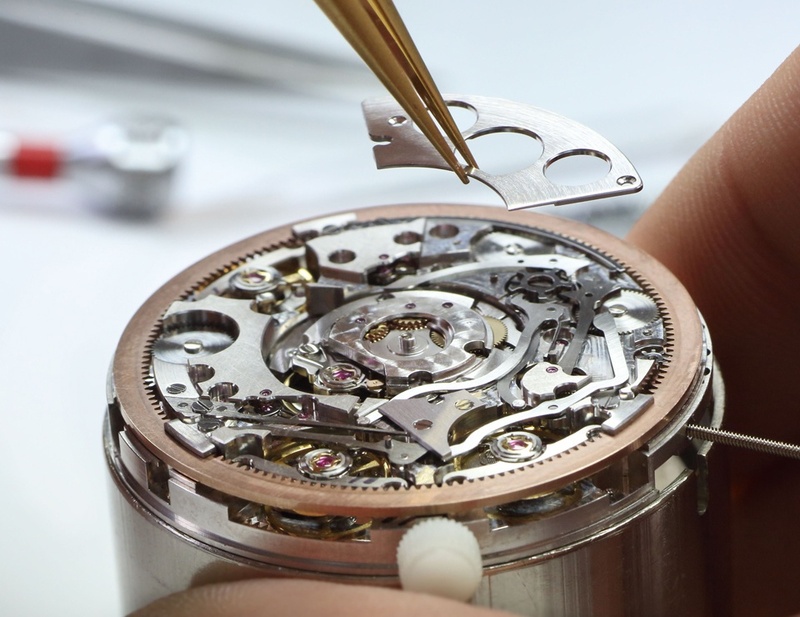 It seems complicated at first, but if you think about it, it is actually very simple and logical and (as far as I know it is a brand new complication, never previously seen). 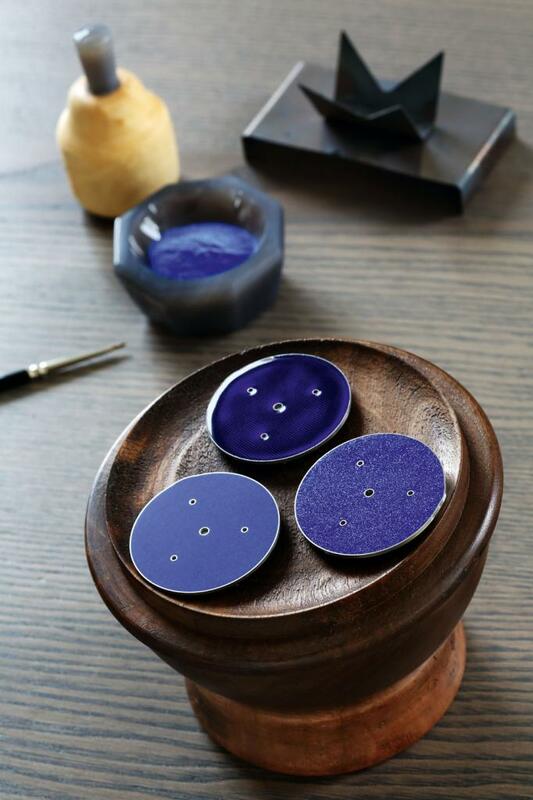 The other thing I love about this watch is the stunning dial, it is a white gold guilloche finished one with the most amazing deep blue grand feu enameling. To make it requires many hours of work and several trips to the furnace, the blue is so deep it looks as if you could dive into it and provides a perfect background for the red and white text. 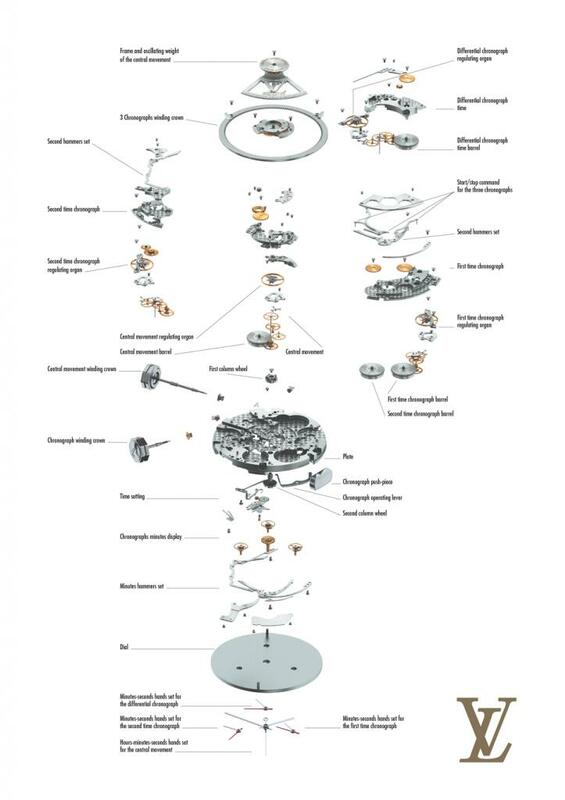 The image above shows the initial stage in the making of the dial, whilst the one below shows just three of the subsequent stages. By the way, the dial is a product of Léman Cadrans, who LV purchased just over a year ago, so this is very much an in house watch. But if the dial is stunning, then superlatives become redundant when talking about the movement; it has 437 components and four driving trains. There are two crowns because the bottom one is used solely to wind up the barrels of the three timing dials, the top one sets the hour and minute hands and can also be used to wind the main barrel, if the automatic movement has been allowed to run down. Despite being waterproof to 100m, it has a sapphire back, allowing the lucky owner to view the wonderfully dense movement. The movement is fitted in LV’s classic ‘Tambour’ case in heavy white gold and the watch is made in a limited run of 30 pieces to celebrate the 30th anniversary of the LV Cup (the run offs for The Americas’ Cup); it will retail for €50,000 plus tax (around $70,000 US). Ironically, I think that this is something of a bargain; no, honestly, hear me out. It is a limited edition of a new complication from a company (La Fabrique du Temps), with a history of craftsmanship & innovation, with an amazing dial in a massive white gold case and it is automatic and waterproof to 100m. The only downside is that, like all Louis Vuitton watches, it is not widely available, LV sell their watches only through their own boutiques and not through stores.